Few things cause more anxiety than fear of the unknown. Prevailing research from the Harvard Business Review and elsewhere reveals the importance of using hard data and constant feedback to properly evaluate sales performance. “You don’t know what you don’t know,” goes the old saying. And in evaluating sales performance, it’s become clear that if you don’t know your numbers, you don’t know your sales force. Two studies recently released by the Harvard Business Review are indicative of this reality, and accentuate the need for Sales managers to become more scientific in their evaluation. Its key insight: You are not a reliable relater of others’ workplace performance. Your psychology simply prohibits it. “Over the last fifteen years a significant body of research has demonstrated that each of us is a disturbingly unreliable rater of other people’s performance. The effect that ruins our ability to rate others has a name: the Idiosyncratic Rater Effect, which tells us that my rating of you on a quality such as ‘potential’ is driven not by who you are, but instead by my own idiosyncrasies—how I define ‘potential,’ how much of it I think I have, how tough a rater I usually am. This effect is resilient — no amount of training seems able to lessen it. And it is large — on average, 61 percent of my rating of you is a reflection of me. Heavy stuff, right? Your own “best judgment” is as reliable an evaluator of quality as the film tastes of your work colleague who advised you to go see After Earth. “In each of the separate studies, the approach was the same: First ask peers, direct reports, and bosses to rate managers on a number of different performance competencies; and then examine the ratings (more than half a million of them across the three studies) to see what explained why the managers received the ratings they did. In other words, there is limited value toward using subjective judgment to measure performance. That’s critical news and a very legitimate reason to worry if you’re using personal judgment as the main driver of talent evaluation in your organization. 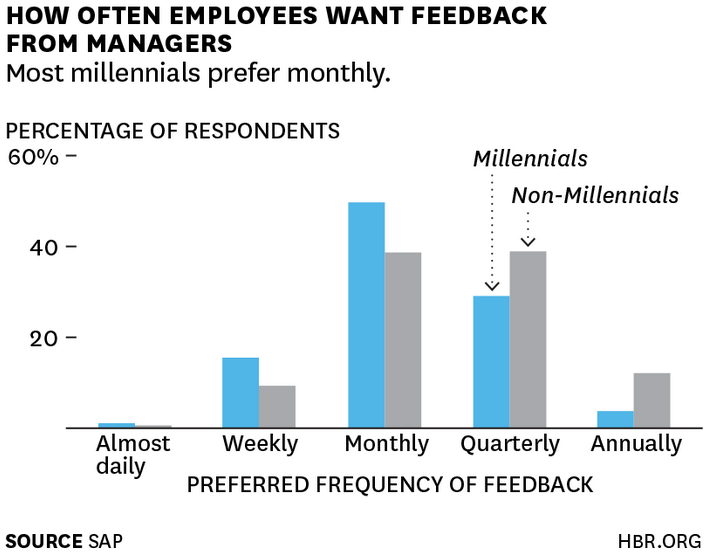 A further finding is that Millennials “seek an approachable manager,” and do not shy away from feedback, but welcome it. Managers can actually utilize this character of their Millennial workforce to their advantage, providing that the feedback their giving is accurate, of course. For Sales Managers who find the latter problems a little too resonant for comfort, there are playbooks available that delineate clear ways to find a solution. 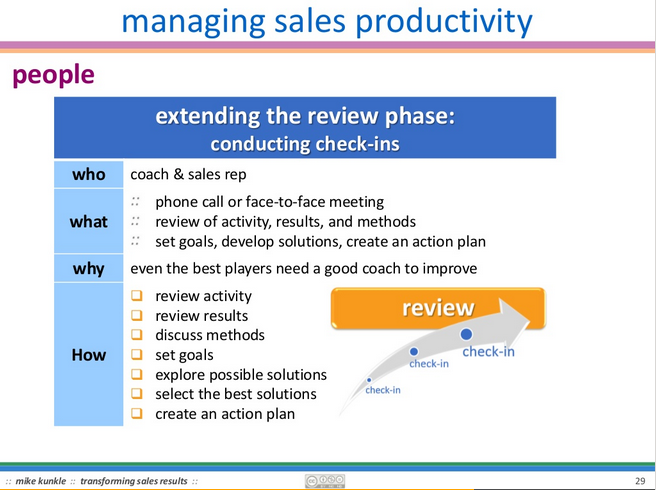 Respected Sales Coach Mike Kunkle has set forth a well-established approach for evaluating sales performance. It solves both problems concurrently. 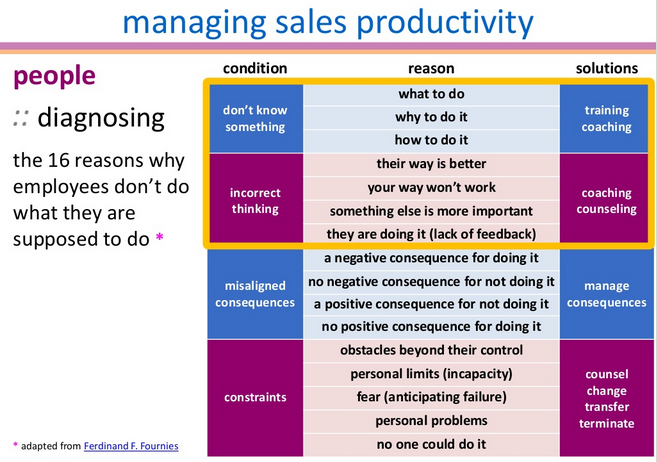 His slide deck, Managing Sales Productivity, offers an analytics-based solution for effectively diagnosing issues, evaluating talent and creating a proper feedback loop. Kunkle outlines 16 reasons why employees don’t do what they are supposed to, with a full half of the reasons involving a lack of understanding about the established process and why there should be no deviation from it. The below two charts offer a great way to create a feedback loop between rep and Manager. The loop continuously cycles and involves goal setting, role-playing, and mutual trading of information. 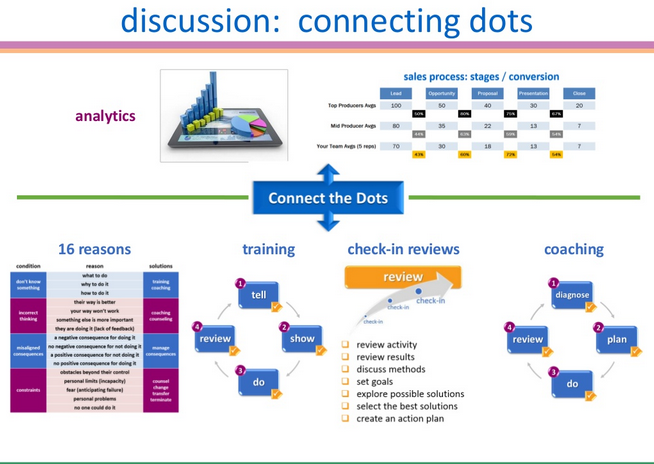 Kunkle also establishes an overall framework of how analytics and feedback all ties together. It’s rare to see such a full-realized, comprehensive, and forward-thinking approach to talent management. Kunkle demonstrates the value that running an analytics-based performance evaluation and training program can have within your sales team. If you’re looking to shore up your sales personnel evaluation, I recommend following Kunkle’s lead. 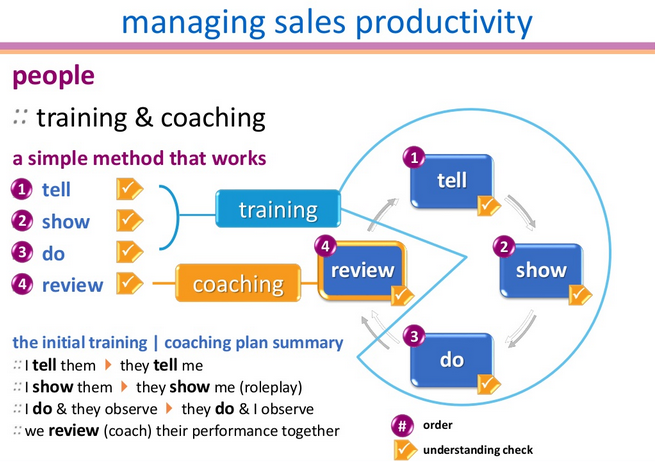 At the very least, use it as a starting point for the program you develop for your sales team. The less you rely on gut intuition with your team, and the more you focus on the numbers, the more accurate your appraisal of performance will be, and the better your Sales Force will be coached, as you eliminate the unknowns from both their own understanding of the sales process and in the process itself as a whole.